Salmon in the Columbia River basin have struggled against slow-moving, warm waters produced by dams. A federal judge has ordered protection for salmon in the Columbia River basin from warm water temperatures that have been lethal to salmon and steelhead as the climate changes. The U.S. District Court for the Western District at Seattle in a 16-page ruling Wednesday ordered the U.S. Environmental Protection Agency (EPA) to protect Columbia Basin salmon and steelhead from dangerously warm water temperatures in the Columbia and Snake Rivers. Climate change has exacerbated a long standing problem with water temperature in reservoirs behind hydropower dams on the rivers, increasing the number days in which temperatures exceed what can be tolerated by salmon and steelhead, which are cold-water species. In 2015, 250,000 adult sockeye salmon died when the Columbia and Snake rivers became too warm. Hot water pushed survival rates for critically endangered Snake River sockeye to only 4 percent in 2015. “Because of today’s victory, EPA will finally write a comprehensive plan to deal with dams’ impact on water temperature and salmon survival,” said Brett VandenHeuvel, executive director of Columbia Riverkeeper, one of the plaintiffs in the suit. The suit was brought by multiple conservation and fishermens’ groups. The court found that the EPA has failed to undertake its mandatory duty to enforce and ensure a temperature daily maximum, just as it must also enforce other types of water-quality parameters under the Clean Water Act. Federal Judge Ricardo Martinez ordered the agency to issue a temperature standard for the river. The Clean Water Act bans Columbia River temperatures over 68 degrees Fahrenheit. Climate change is making that hard to achieve as the river soars even above 70 degrees for days at a time. Snake River steelhead fishermen in Idaho have paid a high price with seasons already shortened because of diminished runs, and then in 2017 cut even shorter as returns collapsed, coming in even below fish managers’ low projections, forcing emergency closures. The ruling comes as the governor’s task force on orca recovery is working on recommendations to help rebuild the critically endangered population of southern resident killer whales, which depend primarily on chinook for food. Orca advocates have joined forces with dam-removal advocates pushing to breach the Lower Snake River Dams to improve chinook runs. 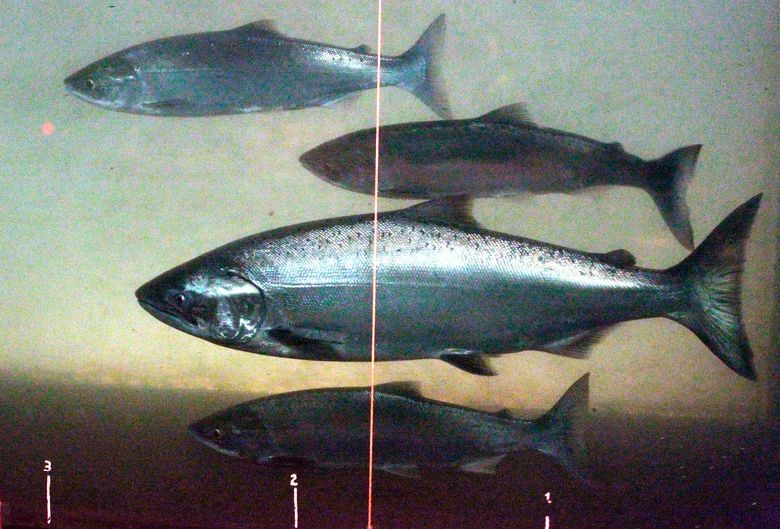 The dams affect chinook and steelhead in multiple ways, by slowing the current into miles-long lakes, creating habitat that predators have thrived in and in which temperatures climb. Billions of dollars have been spent to alter the dams to improve fish passage with success; however, each dam still takes its toll, and the fish runs are not on track for recovery, particularly wild fish, the ecological mainstay for long-term recovery. Task-force members are considering dam removal as well as increased spill of water over the dams among multiple other changes to boost orca recovery. Correction: An earlier version of this story incorrectly stated in the last paragraph that Tahlequa was one of the two whales that died this summer. It was in fact Tahlequa’s calf that died.